Beautiful eyebrows in 5 minutes? Yes. But will they last? A long review with photos. Hello! Today I want to share my impressions of the MAYBELLINE Master Shape eyebrow pencil. I never cared much about my eyebrows. I did them at home by pulling out some individual hairs and then applied eyebrow shadows or filled them in with pencil. They wanted to make it easier, but only made it more complicated really. A fascinating product with a tricky application process. Perfect shade for my eyebrows that matches my ashy hair well. 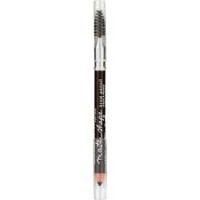 NYX Auto Eyebrow Pencil in Charcoal.